There is no rule that says your name has to be big and bold, but this is why they usually are. 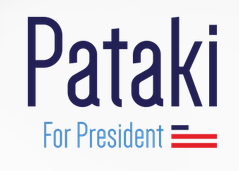 We like the typeface, but not for Pataki, though it works fine for the slogan. More troubling is that incomplete stylized flag in the lower right. Design pundits have called it out as a bar graph indicating a 4-1 lead for Republicans. [Not a good telegraph for a Democratic candidate!] We think they really missed the mark. Our first impression was the World Trade Center. For you youngins out there, Pataki was the governor of New York when the September 11th attacks took place. And while the twin towers actually crumbled to dust, this image simplifies that they just fell over. If this graphic is actually intended to be the twin towers, and we hope it isn’t, it’s in terribly bad taste. Refreshing design. No unpleasant aftertaste! Now his is much better! No haunting reminders, just good old American campaignery! A big bold name with a graphic element that works with the type instead of against it. In a shorthand situation, the graphic and P can even be used as a standalone image. While we used Packenham, the P didn’t quite line up with the graphic so we tweaked it a bit for balance. This is something graphic designers do called customization. Close, but still just a cheap cigar. Did we get it? Maybe. Maybe not. Honestly we like them all! This is a slightly more complicated graphic that better represents the American flag, yet seems a bit too busy. It does afford a solution to the negative space issue though. For the shorthand version you’d only be using 3/4 of the graphic which isn’t quite jake in the marketing world as it muddies the brand. You really want something that plays the same in both situations, but not everything in this world is perfect, right? We’d be willing to keep at this, George, but not for free! Give us a call and a stipend and maybe we can get you through Iowa and on to New Hampshire!